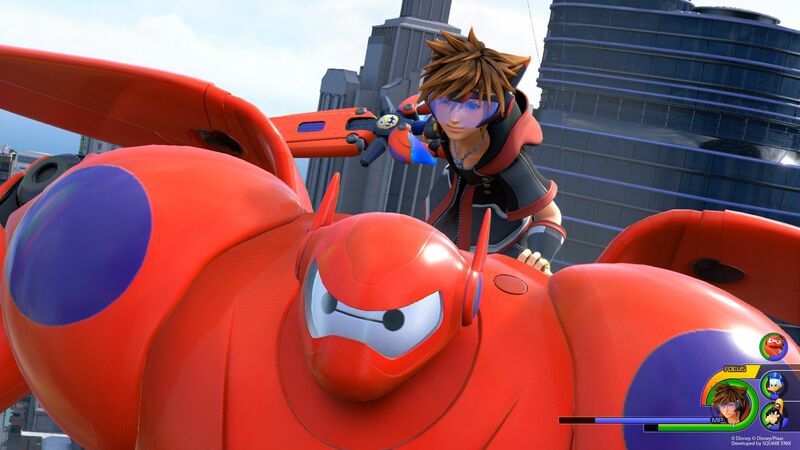 Tokyo Game Show 2018 formally revealed the Big Hero 6 world for Kingdom Hearts III, San Fransokyo. We got a look at in-game footage of the world at the time, but now we have an even better opportunity to see this new area. Square-Enix released a new set of high-resolution screenshots. In addition, we also get a look at new portraits of the heroes that make up Big Hero 6. These screenshots don’t seem like much, but there’s a lot to unpack here. First off, we get a look at Sora’s appearance while he’s in the world. It may not be as dramatic a change as the ones in the Toy Story or Monsters, Inc. worlds, but it’s appropriately high-tech for the bustling city of San Fransokyo. None of the Big Hero 6 characters were part of the cast list that came out recently, so we don’t know if the film’s cast members will be reprising their roles. In addition, we get some quick glimpses of Kingdom Hearts III’s story beats. There is an awesome shot of Big Hero 6 teaming up with Sora, Donald, and Goofy . We also get a shot of Vanitas attempting to stake an unconscious Aqua with his Keyblade. This shot somewhat mirrors a similar scene in Kingdom Hearts: Birth by Sleep, save for some small differences. We do know that Aqua will be a boss in Kingdom Hearts III, so maybe this scene plays into that. We see the much-maligned Gummi Ship too. We still don’t know exactly how the Gummi Ship operates in Kingdom Hearts III, but it’s been a big point of contention for fans of the series, so hopefully that’s been improved.